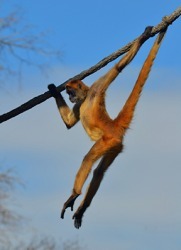 The prehensile qualities of a spider monkey's tail allow it to travel easily in the trees. The definition of prehensile is an animal's limb or tail that has adapted to be able to grasp or hold. An example of prehensile is the tail of a monkey. "prehensile." YourDictionary, n.d. Web. 09 April 2019. <https://www.yourdictionary.com/prehensile>. Able to seize, grasp, or hold, especially by wrapping around an object: a monkey's prehensile tail. Having a keen intellect or powerful memory: a prehensile mind. French préhensile from Latin prehēnsus past participle of prehendere to grasp ; see ghend- in Indo-European roots. Adapted for seizing, grasping, or holding, especially by wrapping around an object. The feet of many birds, the tails of monkeys, and the trunks of elephants are prehensile. From French prÃ©hensile, from Latin perfect passive participle prehÄ“nsus, from prehendÅ (“grasp, seize"), + adjective suffix -ile, from Latin -ilis. It is arboreal, bright green above; the end of the prehensile tail is usually bright red. They are less strictly nocturnal in their habits; and with one exception live entirely in trees, having in correspondence with this long and powerful prehensile tails. They are of a lighter build than the ground-porcupines, with short, close, many-coloured spines, often mixed with hairs, and prehensile tails.